Good books begin with a point of connection for the child – a character with a problem or situation they can relate to. Great books begin with that point of connection and then widen the lens. They continue to build, adding layers and exploring what the story is really about. The character’s problem can be seemingly tiny, because very small problems can feel big to a child. As the story unfolds, it becomes apparent that the problem, and the way the character deals with it, represents something deeper, such as a universal emotion or developmental milestone. These picture books deftly manage to explore a deeper point of connection within the confines of a satisfying story. Ruth is offering a signed copy of her book, Made by Maxine, to one lucky winner. To be eligible for prizes throughout the challenge, you must be registered by March 4, comment on each post, consistently read mentor texts, and enter the Rafflecopter drawing at the conclusion of ReFoReMo. Ruth, I love MAKING A FRIEND. I love how in the context of creating a snowman, beaver not only builds a friend but discovers he's made a special friend, too. Thank you for reminding us to dig (and build in) that deeper, universal meaning. Ruth, Thanks for sharing this great list. Finding deeper meaning is important to all stories. I completely agree with your point that 'little problems' are not little to the child, and this is such an important thing for 'big people' to remember. I can also totally relate to 'Don't Touch My Hair'!!! What a great way to look at picture books. Thanks for this post. What seems like little problems are HUGE to little people. Thank you for these titles! Creating books that make a child feel is key, and children feel deeply about all types of things, big and small. Thank you for the wonderful examples. Great topic to explore. 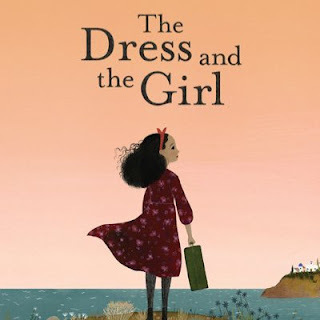 "The Dress and the Girl" was the only one new to me and I'm so glad to now know this lovely book! I’ve never thought about how a specific problem, like breaking a crayon, could broaden to cover a more universal theme while still staying within the focus of the original problem. I have one specific story in mind that I think this will help! Thank you! These were all new to me! Thanks for the suggestions! Thanks, Ruth! I connected with MAKING A FRIEND and THE DRESS AND THE GIRL. Making the connection to a universal theme is so hard, but fabulous when done well! So true that a tiny problem can feel huge for a child! Will be thinking of that as I read through these. Thanks for this selection of titles, they were all new to me. The Dress and the Girl is simply beautiful. Thanks for the reminder that tiny problems are big problems for a child - everything is always a new experience and emotion! Thanks for your excellent list of mentor texts! What great mentor text suggestions and great advice. Thank you! I'm going to have to check these books out. Thanks for the post. Yes, connect make readers passionate about the book. What we have to remember as adults writing for children: "...very small problems can feel big to a child. " TY. You've gathered a wonderful collection of picture books showing a range of kid-relatable problems. Thanks for the insights. I'm going to recommend Allie All Along to our counseling office-it's a good one for dealing with emotions. I really enjoyed the Making a Friend and the The Dress and the Girl as well. I heard an interview with Camille Andros and it really was interesting how it all came about. Very helpful perspective. We need to remember to see things through a child's eyes. Taking a small problem and showing its universality is essential. Thanks! It's amazing to work as a school librarian and see the children struggling with these "small" problems and then have to have a book that doesn't hit you over the head with the message to share, is so wonderful. This is one thing I love about Picture Books. Thank you for these texts. I can't wait to read today. Thank you for your selections. I loved reading them all. Connections is a good word to post on my bulletin board. What great stories that provide deeper meanings! Thank you, Ruth. A child's problems can seem like the entire world to that child, so it's great that we as PB writers can help children understand and deal with problems in a less in-your-face way. Great list! It’s sometimes hard to remember that the problem from a child’s perspective might be so different. Thanks for these recommendations. I appreciate these recommendations. I look forward to searching for deeper meanings! What a great list. And so important to remember that small problems can seem enormous to a child. I can't wait to read these books! Thanks so very much. Thanks for sharing these books, Ruth. I haven't read any of them. Thanks for sharing this list. I will be reading for deeper meaning! A great list of mentor texts, Ruth. As you have pointed our, connections are important. Thanks for sharing. Great list -- I loved Allie All Along! Love the focus on connections and how lens widens to what the "story is really about." Thanks, Ruth! Thank you, Ruth. I am looking forward to reading them for new insight. I loved all these books, for different reasons. Albie - loved the way anger was portrayed, and the diffusion solutions. 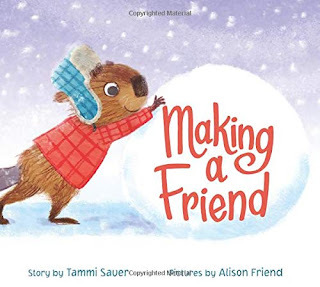 Making a Friend - such a concrete way to show how to make a friend, and also make (real) friend. My snowpeople don't participate much in parades, either. It’s so important for kids to make connections when reading. Thank you, Ruth. I love this perspective. Connections are so important! Thank you for your post! The cover of Allie All Along always makes me smile. Thanks for the great examples. Two are new to me! Love the cover of Allie All Along. These books all look like subjects a child would like to read and find out what 'they' say - to help the reader get a few more skills to deal with that very situation him/herself. It's like support in treading about those who have had 'that problem' before. Thanks, Ruth, for the important reminder that good books begin with a point of connection for the child, and that we writers need to build on that and widen the lens, remembering that small problems are large problems for a child. I would have appreciated a sentence or two about how these 5 books accomplish this. I’ve checked and none of them are currently available in my tri-county library system. Such great examples--I hadn't read I am the Boss of this Chair and really enjoyed it. Thanks for reminding us that what might *seem* like a small problem to us can feel very large to a child. Great list of books, Ruth! I adore Made by Maxine -- a great book that also has a character with a problem and then the lens continues to widen as you add layers. Thanks! These are great books! Thanks so much. Love these titles! There are a few I haven't read, but now I'm going to! WHen I was teaching,having children make connections with books was a priority. Ruth, your simple, concise and insightful description of a "worthy" PB is one that I copied onto a Word file and printed. I now have your words posted in my home office to inspire me as I write and rewrite. There are SO MANY STORIES TO TELL and SO MANY WAYS TO TELL THEM. My brain gets fuzzy and befuddled. Your words will clear the fuzz. Thank you! I wish you continued success in your writing journey! Ruth, your views on connections have been recorded in my notebook so I can refer to them over and over. I've never read a more concise and clear explanation for building a meaningful PB. Each of these books further demonstrate your wise words. Thanks so much! You summed up the art of creating PBs perfectly, Ruth! Connections in a child's life are a part of what we write about, thanks for sharing these titles. Making a Friend--love the vulnerability of beaver and the sweetness of his new friendship. Most kids will connect since all of them have had to make friends. Thank you, Ruth, for sharing your thoughts on connections. A great story is one a child can relate to, and you gave wonderful examples. Love the idea of staring with connection and widening the lens. Thank you! You’ve said much in few words, Ruth. I appreciate your Baby Loves Science séries and I look forward to reading Maxine. I have a critique scheduled with you in MY at the WOW conference and I am looking forward to hearing what you have to say about my manuscript. I love how different each book is and yet how they all completely work with the concept for today. And so important to remember that little things are a BIG deal to children. I am waiting to get these from my library, but it looks as if they will be good reads. Thanks for the list. Such a fan of Ruth's Science board book series! Thank you for the wisdom. Thank you for these mentor texts, I very much enjoyed them and hadn't read them before. Wonderful! Thank you for bringing these to our attention and this topic! I hadn't read these before! Child relatable! Thank you, Ruth, for sharing these mentor texts to study the relationship of child to story. Yes, this the key element that keeps a book from feeling "slight." Thanks for a great list of examples! "Great books begin with that point of connection and then widen the lens." I love that quote. Thanks, Ruth! Great to read these books that value the point of view of the young child. Thanks for sharing these. Connections are so key. Thank you for this post. Thanks you for the examples of books that show a deeper level of connection in the story. I totally agree that a tiny problem can feel huge to a child! Looking forward to getting these from the library! Off to the library web site to order these. Thank you, plot is my most difficult area. I love this...find the point of connection. True. True. Thanks for your mentor books too. Great post, Ruth! Thanks for sharing your #kidlit wisdom. Making that connection is a uch an important part of picture books. Thank you for these examples and this post! 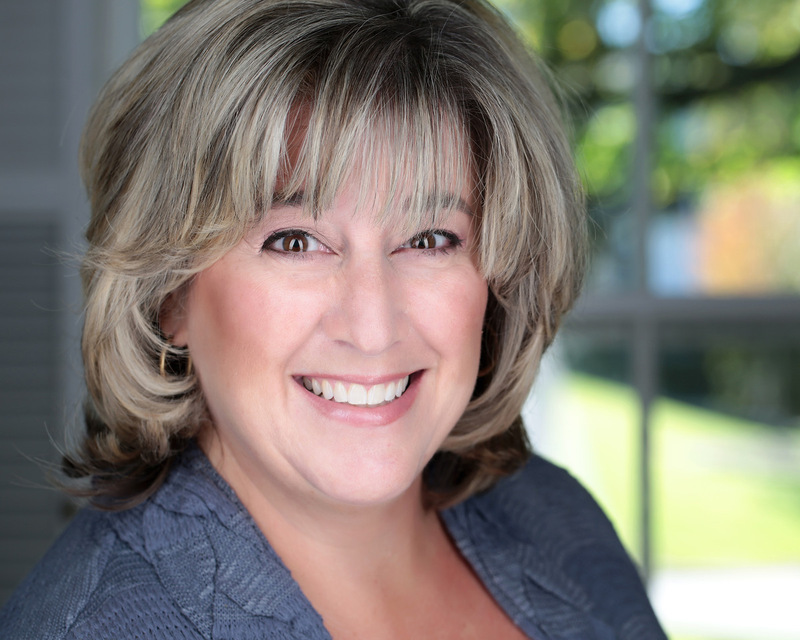 Ruth - Thanks for a great post with excellent examples! Thank you for the great list of books. And you're so correct, little problems can be earth shattering for a child. Thank you for these suggested books, only one of which I have read so far. What a great bunch of books! The Dress and the Girl was so sweet and so unique! Ruth, thanks for showing so many books with small, relatable hooks. Childhood is when humans start learning to deal with these challenges, and these books are all great examples. Really relate to ALLIE ALL ALONG! We had an Allie or two in our family. Great choices for books about connections. 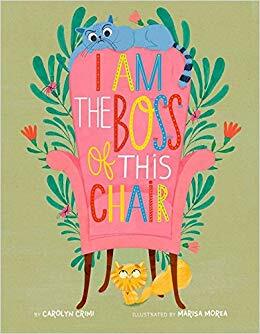 I especially liked "I am the Boss of this Chair", having raised several cats over the years and can picture these antics in my home. I also feel a true connection to a child for the story in "The Dress and the Girl." So far I've only been able to get "Don't Touch My Hair" and "Making a Friend" from the library. I loved how both of them used clever twists to add whimsy and humor to sensitive topics. "Great books begin with that point of connection and then widen the lens." Such a good reminder. Thanks for this post. You are so right in sharing how important it is to begin with the point of connection for a child and then build layers. The problem for me is keeping the word count down while trying to do that! Great inspiration here, thank you! It's so true that the tiny problems are huge to a child. My problem is always throwing in too much. These books show how to stay with one message. Thanks for the insight. Connecting first is the key! Thank you for sharing this insightful article. Thank you for writing about this important topic! All new books I haven't read. Thank you for the suggestions. Thanks for sharing these! I think I maybe be testing the limit of my library card! Thanks for the great list of mentor texts. These connections serve as points of entry into the story and help to add the emotional layers to the text. I appreciated the reminder to think "small." Cool! I've never heard it described quite that way. Start with a point of connection! That connection and needing to relate is so important for children. Thanks for sharing these books! This was a good post to remind us to introduce the problem early on for the reader, but to also make sure we are establishing some kind of connection. I liked how today we were reminded to focus on the little things that can make a BIG difference. And I loved the literal interpretation of stripping down the layers in ALLIE ALL ALONG. This post made me think and go back to read several of my MSs. Thank you. Thanks, Ruth! I haven't read all of these, but I read I AM THE BOSS OF THIS CHAIR the other day and I absolutely loved it! It's a perfect example about connecting to others and making that connection turn into more. Awesome post! My mind went immediately to two of my WIPs and how I could apply your thoughts. Thanks so much! Read these to my 2 year-old granddaughter. She has curly hair too. I love The Dress and the Girl. I have to look up the others! I love the reminder about how seemingly small issues to us, can feel huge to kids. It is a great reminder to write at their level/connect to what is on their minds. Thanks for these recommendations. Love so many of these books! Agreed! What seems trivial to an adult can be huge for a child. And I love the image of 'widening the lens'. Can't wait to get my nose in some of these books that I haven't read yet. "Good books begin with a point of connection for the child.
. . . the problem, and the way the character deals with it, represents ... a universal emotion or developmental milestone." Remembering this! I like the variety in this list. I think it's easy for me to get distracted by the humor in some books, so I'm taking another look at I AM THE BOOS OF THIS CHAIR. I appreciate this list and am excited to read the ones I haven't read yet. Thank you for sharing! Finding that connection has been a struggle for me. Thank you for these mentor books. I look forward to studying them closely. I am looking forward to reading these books. Not one is at our library... yyet. I also thought about my favorite books and the layers their authors added to take them from good to great. While I am scouting for them, then looking at my own work to build in more layers. Great post. Thank you! I love this thought that a little problem can be enough for a picture book because it can feel big. Definitely true in my house. Thank you for this list. It's important to know issues that seem minor for adults are HUGE for a child. 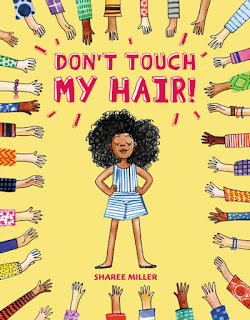 I love these books, especially DON'T TOUCH MY HAIR. I'll definitely be sharing that with my sons. Thanks for the list! 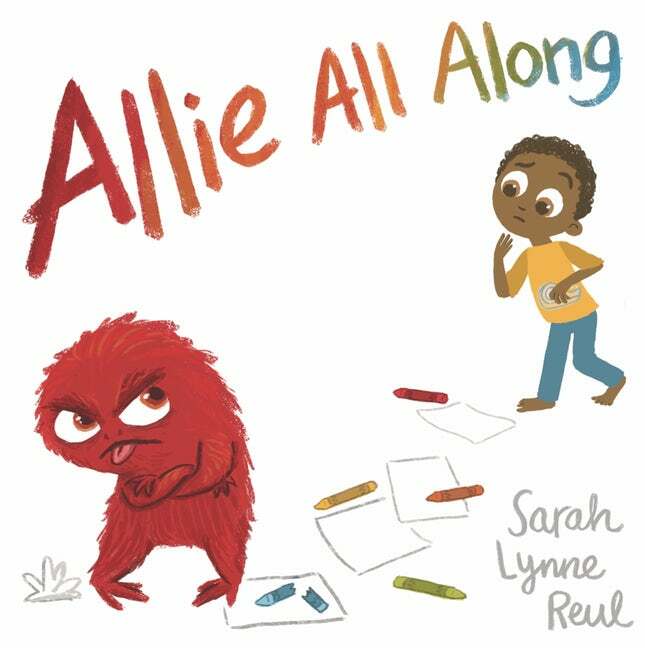 Allie All Along is a perfect example of how even small problems can be overwhelming for a child, and beautifully illustrates the process of a positive way to calm down. I love Allie All Along and I think it's a good one to help kids deal with their anger emotions!I also LOVED I am the Boss of this Chair. I had a similar experience in my house where my 1st cat was very territorial. Great choices for making connections! Small things can feel big to a child. Thanks! Thoroughly enjoyed reading these books after reading your comments and seeing how relatable the stories are. .Thank you for such great recommendations. I love the way you highlighted the "point of connection for the child." Thank you for these book recommendations! They were all new to me! Thank you for these - and for pointing out the initial, possibly small (to adults) point of connection for a child that can lead to larger, universal themes. Love this list--thank you! It's a good reminder to think about those points of connection. Thank you Ruth! I LOVE this: "Great books begin with that point of connection and then widen the lens. They continue to build, adding layers and exploring what the story is really about." Great choices for mentor texts, too! Great list- and some titles I have yet to explore. Thanks! Allie All Along is the kind of book kids need to understand how to build resiliency. It's difficult to portray the process for calming down from high anger, but this book did it beautifully. Just reread I am the Boss... so full of color and humor. Super child-friendly exploration of sibling rivalry. The lens starts narrow, widens, and narrows again for the satisfying conclusion. Thank you for the reminder to look for those connections with kids. Making that connection in the beginning really hooks the reader. Great list of mentor texts! Connections and layers - good advice and mentor texts. Thanks. I love these books! Thank you for this list. What great recommendations on books that make these important kid connections and build on them. Thanks so much! Thank you for reminding us to find a connection with our young readers. That's why we write! I'm adding Making a Friend to my collection of friendship stories to read with my first graders. Making friends doesn't come easily to everyone and I think they'll be able to relate to Beaver's initial ineptness. Lovely titles, thank you for introducing me to them. Just lovely and new family favorites. I am the Boss of my Chair is a new favorite! Thank you! Thank you, Ruth. Each book on your list was new to me! 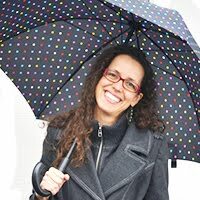 I loved your quote: "because very small problems can feel big to a child." That is so true! And important for us parents and writers to remember. Like others here, I dug the visual metaphor in ALLIE ALL ALONG. I think the book makes for a great conversation-starter for reader and child: emotions as clothes that we can choose to wear or discard. I do think it’s interesting how this book portrays “negative” emotions like anger and even depression as something that covers us up or makes us appear different than our “normal” selves. Allie becomes a fuzzy red monster at her angriest, but isn’t anger, regardless of how destructive or out-of-proportion it may seem, a human emotion, rather than the aspect of some fantastical monster? Is Allie not REALLY Allie just because she’s feeling angry at the moment? It might not be an attractive outfit, but it is still part of her wardrobe, no? Compare this to another title we’ve read this month—THE ROUGH PATCH—that depicts the MC as physically unchanged yet still working through the same feelings as Allie and learning how to cope with and manage those feelings. Reading these two titles side-by-side could do much to inspire a child’s critical thinking and understanding of how one subject can be depicted by two different artists. Speaking of valuable lessons, DON’T TOUCH MY HAIR has got a great one. It not only speaks to an important social grace that touches on race and ethnicity but a more universal concept of consent. I loved how Sharee Miller acknowledged both parties’ involvement in this transaction, the difficulty of saying “no” to someone as well as the difficulty of hearing “no” from someone. In situations such as the one faced by Aria in the book, it’s easy to vilify the intruding party as ignorant and insensitive, and while that is typically true to one degree or another, nothing is gained from shaming that person for their actions. Instead the book promotes a culture of understanding, a process that can only be achieved when both parties are aware of each other’s feelings through open communication. 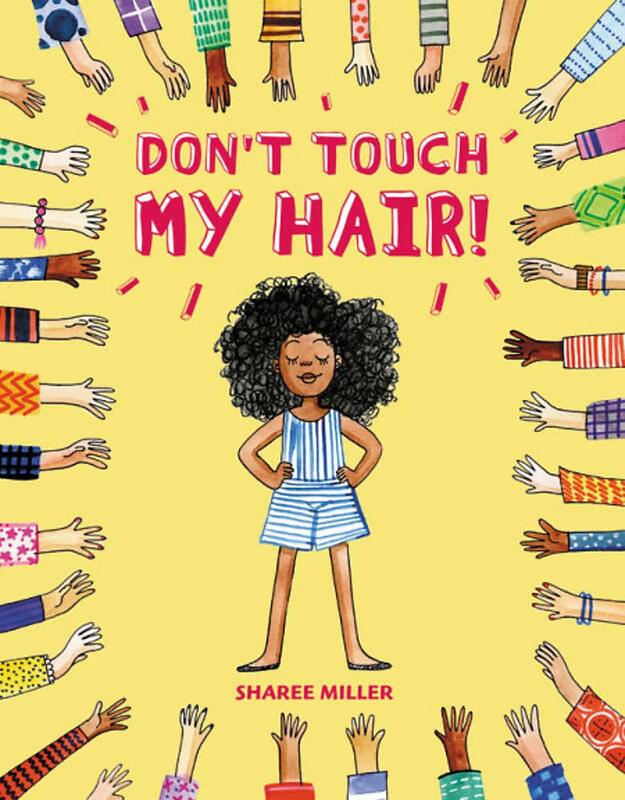 DON’T TOUCH MY HAIR may sound like a warning, but the book itself is actually an invitation for readers to co-exist with one another and respect the rights to happiness of same. I have requested these books and they should be coming. Great for conversation starters with students. I am the boss of this chair is one of my 4yo's favourite books. I didn't find any of these books, but learned more about them through research. The Dress and the Girl and Don't Touch my Hair are specially appealing. Very much appreciate the sentiment that small problems can feel like the world to a kid! Thank you Ruth! I hadn't read these before! Really enjoyed how these stories played out. A good study for me. Thanks for this list! Thank you for shedding light on a really important component. I love how you said, "Great books begin with that point of connection and then widen the lens." So true! The books that have stayed with me are the books that successfully add those layers you describe. 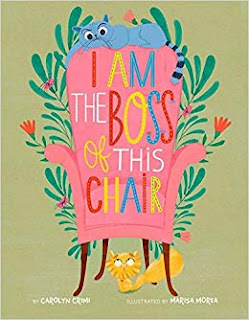 I loved how I Am The Boss of This Chair starts with a cat, but the cat is child-like and has a very relatable problem - encountering a new sibling or someone new to share with. Love how the lens then widens to have the character not only address the issue of sharing but also why it might be more fun to share (while still pointing out that not everything needs to be shared). Smart choice by the author to use cats to communicate the concepts since it gives enough emotional distance for children to feel safe approaching and talking about the MC's problems. The other examples you mentioned are fantastic as well. Thank you for sharing! Thank you for the recommendations! I've always been in awe of books that can take something small and bring it to a bigger, deeper level. We read Don't Touch My Hair as a family, and talked a lot about the character's feelings. A few hours later, I overheard my child (who struggles with keeping hands to self) talking about the book with others. I love it when a great book successfully conveys its message!